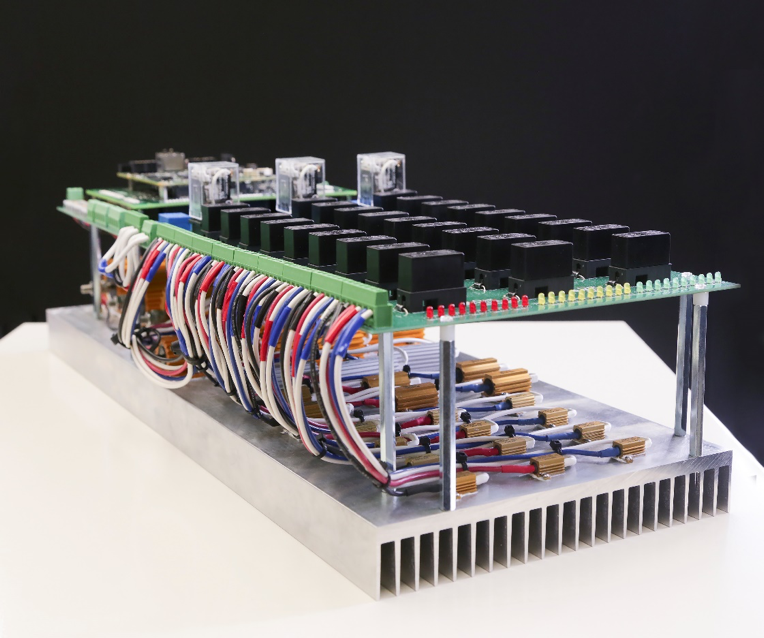 A component of the SI-GRID microgrid testbed. 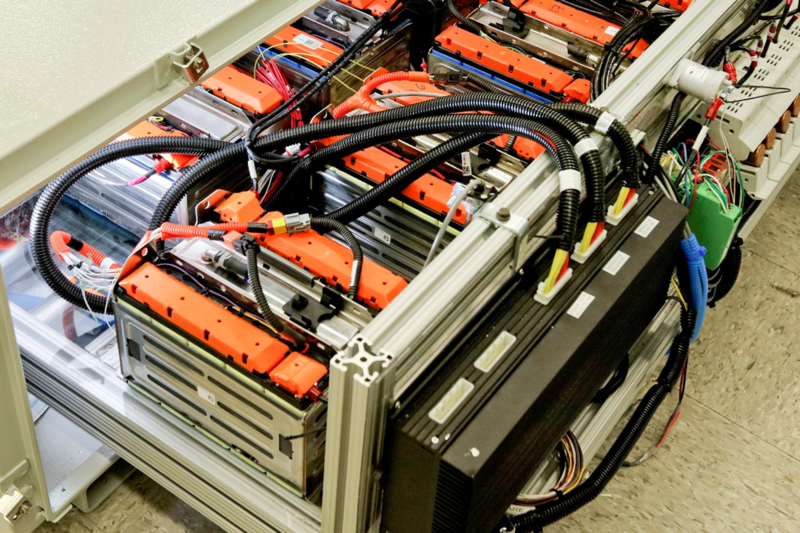 A view into a secondary vehicle battery energy storage pack. L-R: Electrical and Electronics Systems Research Division engineer Peter Fuhr, Director Rick Raines discuss sensor arrays created and undergoing testing on the Chattanooa EPB utility system. Hardware for a smart home energy router. As the nation’s power grid continues to become modernized, consumers and businesses will see more benefits, including greater reliability, faster restoration of service when disruptions occur, more use of renewables such as solar, and better information about their own consumption. At the same time, the grid faces challenges such as aging infrastructure and threats from manmade and natural events. With funding announced last month by the Department of Energy (DOE) to improve the security and resilience of the nation’s critical energy infrastructure, including the power grid, scientists at Oak Ridge National Laboratory (ORNL) will explore novel methods of protecting vital power systems and increasing the grid’s ability to withstand and recover from disruptions. The seven Resilient Distribution Systems projects, awarded through DOE’s Grid Modernization Initiative (GMI) to the Grid Modernization Laboratory Consortium (GMLC), will develop and validate innovative approaches to enhance the resilience of distribution systems—including microgrids—with high penetration of clean distributed energy resources (DER) and emerging grid technologies at regional scale. ORNL will be involved in two of the Resilient Distribution Systems projects, addressing ways to enhance the resilience and flexibility of electricity distribution systems, including the use of microgrids, or localized grids that can disconnect from the traditional grid to operate autonomously and help mitigate grid disturbances to strengthen grid resilience. ORNL’s projects will focus on integrating responsive loads into distribution management systems, providing electric utilities with software and hardware; and using flexible energy resources and microgrid assets enabled by Open Field Message Bus (FMB) to increase distribution resiliency. Open FMB is a framework that allows generation assets to communicate with one another for better system flexibility, rather than being controlled by a single system. The 20 cybersecurity projects supported by DOE’s funding will enhance the reliability and resilience of the nation’s grid and oil and gas infrastructure through innovative, scalable, and cost-effective research and development of cybersecurity solutions and operational capabilities. ORNL will be involved in five of the projects: DarkNet, quantum physics, Malware Operational Migration, energy system trustworthiness, and quantum key distribution. The DarkNet project focuses on defining a secure energy delivery control system network that is independent of the public internet and uses existing but currently unused optical fiber, called “dark fiber.” The quantum physics project involves the development of a quantum-rooted grid security framework, carrying information in quantum states of light so that any attempt to read the information is revealed in real-time, detectable changes. The Malware Operational Management project brings together energy sector partners to coordinate utility system malware detection and analysis, providing real-time validation of vulnerabilities. The energy delivery systems project will create a tool to verify the integrity of firmware used in energy delivery system devices, without taking the equipment offline. 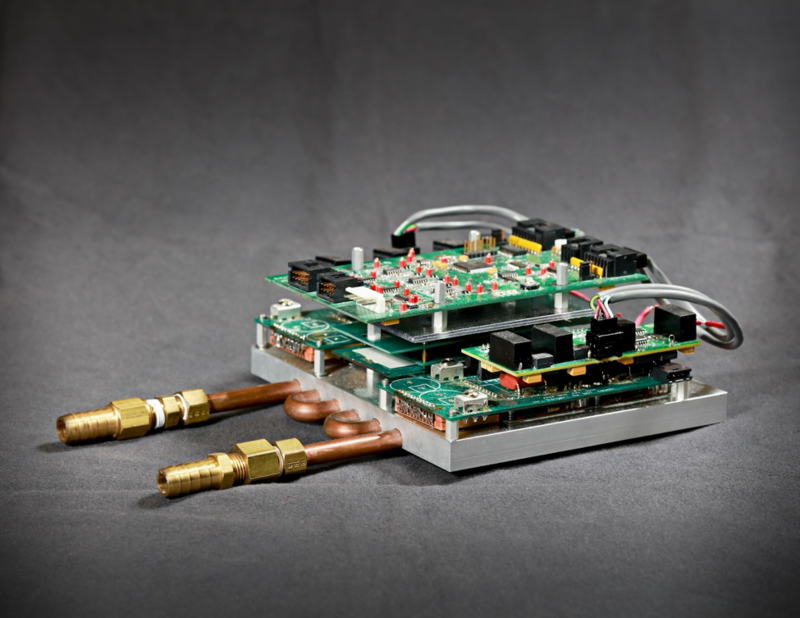 ORNL is a project partner with Los Alamos National Laboratory in the quantum key distribution for the energy sector project to research, design, and prototype a quantum secure communication operation network, with trustworthy relays to extend distance and decrease cost for critical energy infrastructure. “These projects continue DOE’s long history of working with public and private partners to achieve the energy sector’s vision of resilient energy delivery systems that are designed, installed, operated, and maintained to survive a cyber incident while sustaining critical functions,” King said. ORNL has a long history of energy infrastructure research, most recently through its Sustainable Electricity Program, developing solutions to meet the nation’s growing need for reliable electric power. Some of ORNL’s work includes: deploying low-cost sensors to monitor grid health; enhancing real-time visualization and data analysis to isolate grid failures and quickly restore power; strengthening cybersecurity for a modern grid; hardening infrastructure with advanced conductivity; developing microgrid technologies that localize energy management; controlling power flows with advanced technologies; and using unmanned aerial systems to inform electric system restoration activities. In 2014, with support of DOE’s Office of Electricity Delivery and Energy Reliability, ORNL launched a partnership with Chattanooga’s Electric Power Board (EPB) to advance power grid technologies. Working together, ORNL and EPB have been learning how to best apply sensors, controls, secure communications, and other technologies to improve operations, using high-performance computing to perform modeling and simulations, allowing EPB’s grid to function more autonomously and reliably. 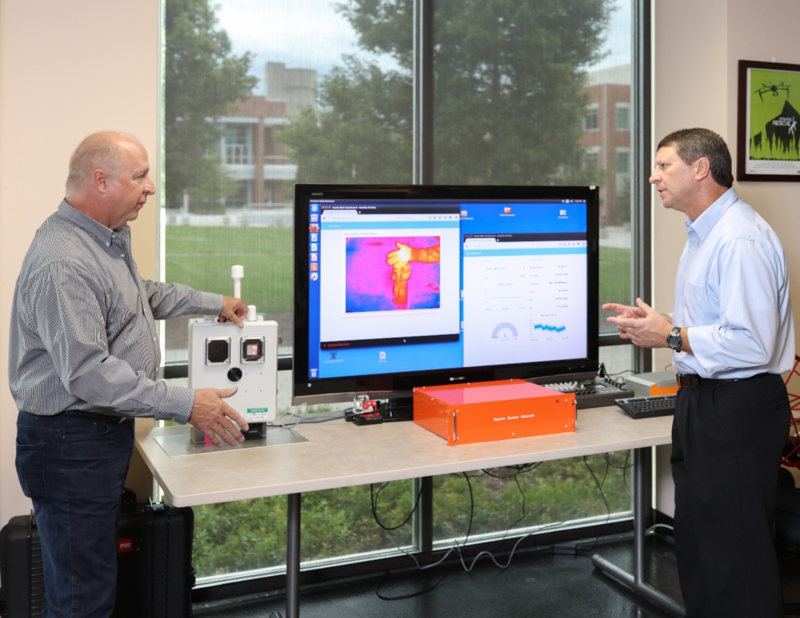 In early 2017, through DOE’s GMLC, ORNL began leading eight other national laboratories to work on EPB’s next project: collecting real-time sensor data so the grid immediately sees fluctuations and can balance its electrical demand with supply. EPB, in partnership with ORNL, is a participant in five separate projects of the GMLC.